Mrs O'Deary's class were busy making animal masks when a dragon stuck its head through the window. "Good morning," said the dragon. "It's my birthday. I hope you're going to give me something nice." Mrs O'Deary screamed and ran from the room. The children stared at the dragon. Its head was as big as the art table. "What sort of something nice?" asked Chris. "Well now," said the dragon. "I like eating." It licked its lips and chomped its teeth, which were as long and sharp as pencils. "I'll wait here while you find my present." It lumbered off to romp around the well in the middle of the playground. "We'd better give it something to eat before it eats us!" said Emily. "I've got a cupcake in my lunchbox," suggested Jade. "One cupcake won't be enough! Everybody fetch their lunchbox," ordered Emily. "We can each give a bit of food to the dragon." So the children rummaged in their lunchboxes. They heaped a tray with cakes and buns and biscuits. "That's not enough for a dragon," said Chris. So they rummaged some more, and added sandwiches and eggs and sausage rolls to the pile. "Still not enough!" said Chris. So they heaped bananas, grapes and apples on the tray in a huge, messy pile. Emily carried it through the door into the playground. "Here's a birthday cake for you, dragon!" she called. The dragon came lolloping across the playground. "Where's the icing?" it demanded. "Here!" said Andy, quickly emptying yoghurt pots over the heap of lunch. "That's better!" said the dragon. It pounced on the cake and gobbled it up. Bits of bun flew everywhere. Yoghurt spattered the children. "Tasty," said the dragon, smacking its lips. "Now, how about my present?" The dragon looked round. "Where? I can't see it." "You just ate it!" yelled the children. "That's no good," the dragon said. "I want a present I can look at." "What sort of thing do you like to look at?" Emily asked. "Well now," said the dragon thoughtfully. "I like gold." "We haven't got any gold!" The dragon narrowed its eyes. "Then you'd better find some," it said. It stamped off to go down the slide. "We've got some gold paint left over from last Christmas," Andy said. "We can paint things gold." So they painted the pencil jars and the scissors pot. They painted the bin, the sand-tray, the nature box, and Mrs O'Deary's swivel chair. Then they took everything out into the playground and piled it up in a big treasure-heap. "Dragon!" called Emily. "Here's your gold!" 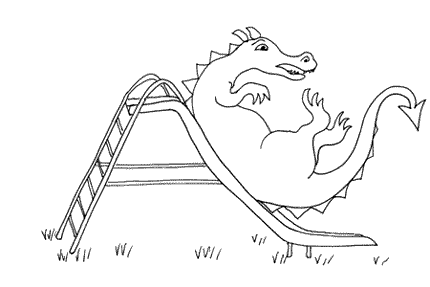 The dragon came thundering over from the slide, which was now bent in the middle like a banana. "Nice," it said. It flopped down in the swivel chair and swivelled to and fro as it admired its pile of gold. Mrs O'Deary came outside, saw the dragon in her chair, screamed and ran back in again. There was a creak, and a loud SNAP. The swivel chair broke into a dozen pieces. It tipped the dragon onto the golden pile. "Ouch!" yelped the dragon. It climbed off the pile and looked at the gold paint on its claws and scales. "This gold's no good!" it bellowed crossly. "It's coming off! It's not real at all. That's no fun. I want a proper present - something I can play with." "Well, what sort of game do you like?" asked Andy. "I like chasing children," said the dragon with a snarl. "And I like burning up schools." And it blew a blast of hot smoke at them. "You'd better hurry up!" it warned. "I'm getting impatient. I'm not leaving till I get my present!" It flapped over to the football posts, threw itself on to the goal net and lay there while the posts slowly collapsed around it. "What on earth are we going to do?" said Chris. "We'll have to make it a game," said Emily. "But how can we? It's bent the slide. It's demolished the goalposts. We can't make anything that's strong enough for a dragon to play with!" Andy looked thoughtful. "Maybe we don't have to make a game at all," he said. He picked up a mask from the art table, went back outside and whistled to the dragon. It came thudding over from the goalposts. It looked at the mask in Andy's hand. "That's not much of a present," it said scornfully. "It won't even fit me." "It's not meant to fit you," said Andy. "It's meant to fit me. It's a wolf mask." He put the mask on. "Ooh!" said the dragon, blinking. "That's quite scary. Now what?" "Now we play a game." "What game?" asked the dragon. "What time is it, Mr Wolf?" The dragon frowned. "I don't know that game," it said. "That's why we're going to teach you," Andy answered. "And since I've got the mask, I'm going to be the wolf." Andy stood against the school wall with his back to all the other children. They lined up a long way behind him. Then they all shouted: "What time is it, Mr Wolf?" "Seven o'clock!" said Andy. They took seven steps towards him. "Three o'clock!" said Andy. So they took three steps towards him. And so on. The dragon needed a lot of help to play the game. It was not very good at counting steps; and having four legs did not make it any easier. Because it took such big steps, it soon got very close to Andy. "I've nearly won! Do I get to eat the wolf up?" it asked eagerly. "No, no, no!" shouted the children. "That's not how it works!" "Then how does it work?" "Just wait and see!" And they all yelled at Andy, "What time is it, Mr Wolf?" At that, Andy turned round and shouted, "DINNER TIME!" All the children turned and ran, screaming. The dragon turned and ran too. Andy chased the children and the dragon round and round the playground until he managed to catch Emily. He gave her the mask, so that she could be the wolf. And the game started all over again. Emily was a very good wolf. She growled at the children and the dragon most convincingly. When she roared "DINNER TIME!" and chased them round the playground, they screamed louder than ever. So did the dragon. When Emily caught the dragon, it cowered and trembled. "Don't eat me!" it cried. "All right," said Emily. She took the mask off. "You put it on now. It's your turn to be the wolf." "Goody!" The dragon perched the mask on top of its head. Although the mask was much too small, it did not seem to mind. "But you mustn't eat anybody," Emily told it sternly, "or we won't let you play any more. Got that?" "Got it," said the dragon. It loved being the wolf. It loved it so much that it wouldn't catch any of the children, but just kept chasing them round and round the playground. Mrs O'Deary came outside, saw the dragon chasing all her class, screamed and ran back in again. At last the dragon had to stop. It was exhausted. "Whew!" it said. It was panting out great gusts of smoke full of glittering sparks. Some of the sparks landed on the sign above the door that said INKWELL SCHOOL: INFANTS' ENTRANCE, with a small picture of a tortoise. The sign began to smoulder and then burst into flames. "Put that out!" Chris shouted in alarm. "Oops," said the dragon. It flew up to the door and flapped at the flames with its wing until they were extinguished. Then it sat down with a thump. "I'm worn out," it sighed. "Was that a good enough birthday present?" Andy asked. "You've had fun. You've chased dozens of children. And you've even set fire to the school!" The dragon thought about it. "Not bad," it admitted. "But there's just one thing wrong with that wolf game." "I can't take it home with me." "Oh, yes, you can!" said Andy. "Keep the wolf mask. You can teach all the other dragons how to play." A slow grin spread across the dragon's huge face. "So I can!" it said. "They'll be terrified of me! I can't wait!" And with the mask still hanging from one ear, it jumped up and began to lope across the playground. It flapped its wings, faster and faster, and then launched itself into the air. The children watched and waved as it circled high above the school. Mrs O'Deary came outside. She looked around in one direction and then the other. She heaved a sigh of relief. "It's gone. Thank goodness!" she declared. The dragon turned and swooped down right behind her. "DINNER TIME!" it yelled into her ear. And then it flapped back up into the clouds and flew away.